650+ blues drum loops and fills with all the traditional must-have rhythms: 12/8 blues grooves, half-time shuffles, blues-rock shuffles, uptempo boogies and other blues shuffles. Drum Werks XII brings the blues with all the kinds of grooves you’d expect. Lay it down hard with some swinging in-the-pocket grooves…only on Drum Werks XII! It’s time for some live, acoustic blues drum loops — nothing but 12/8 grooves, shuffle beats, and swinging rock drums! It’s all here on Drum Werks XII if you play the blues. This download sample pack of blues drums loops has the all the groove styles you’ve been after. This essential set of blues drum styles, from essential 12/8 drum tracks to pumping uptempo shuffle drum loops, will inspire new blues tracks for all songwriters. 650+ blues drum loops and fills with all the traditional must-have rhythms: 12/8 blues grooves, half-time shuffles, blues-rock shuffles, uptempo boogies and other blues shuffles. That’s what Drum Werks XII is all about – laying down the authentic blues drum tracks for the blues man in all of us. Think you can program shuffle drum beats in MIDI and get the elusive feel of a seasoned pro? Think again. Drum Werks XII is a complete songwriting package for multiple styles of blues and blues-rock songwriting, featuring over 675 acoustic drum loops, including main grooves, groove variations, fills, and one shots. In short, if your music needs 100% acoustic and authentic blues drum tracks, this is the sample pack you need. It’s time to get out the guitar and get ready to lay it down to some greasy blues goodness! 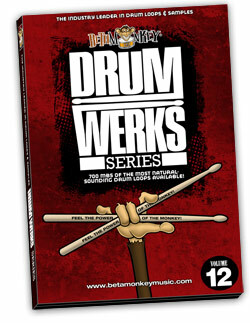 Please Note: Drum Werks XII is a drum loops pack only. All demo tracks containing music are for illustration purposes only. You get a wide span of tempos with Drum Werks XII. From a laid-back 60 BPM Groove Set™ to a blistering boogie collection at 180 BPM, it’s here. In other words, we’ve covered lots of tempos and blues feels. Drum Werks XII will deliver the no-nonsense “let me dig into those pentatonic scales again” inspiration your music needs. And, for even greater songwriting flexibility, we’ve included a complete matching multi-velocity drum and cymbal sample set of all the drums used to record the drum tracks. Every drum and cymbal used from these recording sessions was meticulously sampled and included with the loops. In the end, you’re about to get some powerful sounds and grooves. Drum Werks XII will inspire the passion and grit of the blues and bluesy-rock genres. So, get going. Stone cold blues coming right up! Full Range of Blues Drum Beats: Whether you need no-nonsense 12/8, half-time and rock shuffles, or up-tempo boogies, Drum Werks XII will bring out your inner bluesman. With tempos from 60 BPM to 180 BPM, this blues collection of grooves will the deliver the authentic blues beats your music needs. Cohesive Drum Sounds: A thick, lively snare, solid kick, and deep resonant toms comprise the clean, natural, and present mix of one of the best drum rooms around. 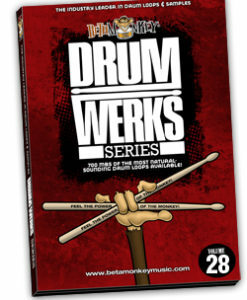 Drum Werks XII is a cohesive sound set with all drum loops are taken from the SAME recording session (all grooves, fills, and samples are sonically-matched). Ideal for changing tempos and feels – all drums from Drum Werks XII will mix together perfectly. Ultimately, consistent sounds ensure an easy and efficient racking experience. Fully-Sampled Drum and Cymbal Samples: Add accents and drum part variations with the included sample set. Likewise, build grooves with the complete sample set of all drums and cymbals recorded on Drum Werks XII. We believe in maximizing the usability and versatility of our groove collections. It’s a very good deal for the price because there are great fills to make the drum track lively and a lot of variations that allow you to find what you are looking for. Fantastic collection of blues drum loops. Great sound, great vibe, great drumming. Everything I was hoping for. I just can’t get enuff of dem Monkey loops!! I bought Pure Country 1,2,3 and Drum Werks XII this time. Thanks for putting out a really useful tool for songwriters/guitar players who don’t play drums! 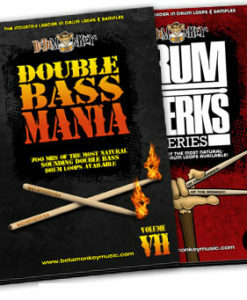 Need rock drum loops that just flat-out groove? From straight-ahead rock to pounding classic hard rock drum tracks, Drum Werks XXVII Groove Rock Drums will inspire your next rock songwriting project with simply rocking grooves. Powerful groove rock drum loops, settled right in the heart of the "groove zone" between 90 bpm to 120 bpm. Straight-ahead, ready to groove. Straight-ahead, hard-hitting songwriting drum tools inspired by some of rock's greatest drumming performances and played by one of the best studio drummers in L.A. This sample library weighs in at a hefty 850 MB of pure, live rock drum samples and loops. Drum Werks XXVIII: Hard Rock offers infectious uptempo and fast rock drum loops. Perfect for tracks needing the high octane feel and power of John Bonham, Simon Phillips, Alex Van Halen, and Dave Grohl. Whether you need hard rock, classic rock or alt rock drum tracks, put these live studio drum loops to inspired use. Grooves sets ranging from 125 BPM to 180 BPM will deliver live, punchy, and powerful rock drums to your recordings.